Calling all Adventurers and Nature Lovers! Come stay in a really cool off-grid home in a land of adventure and magic – The Toucan House at Better in Belize EcoVillage! Enjoy an earth-friendly vacation this summer. Come stay at our Belize eco-lodge, tucked away in a 132-acre rainforest in the foothills of the Maya Mountains. 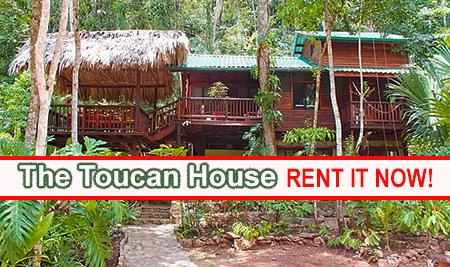 Stay at The Toucan House, our beautiful rainforest eco-lodge. Whether you’re seeking recreation or relaxation, book your vacation at The Toucan House now! In a hurry? Call 1-877-836-2756. Travelling with your family or a group of people? 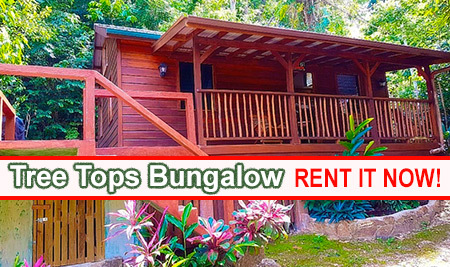 Our cozy Tree Tops Guest House can accommodate up to 6 people and has an equipped kitchen, deck and patio for your outdoor dining pleasure. Book Tree Tops now! Or call 1-877-836-2756. Set in a 132-acre eco-village in the foothills of the Maya Mountains, The Toucan House Eco-Lodge and Tree Tops Guest Cabin are set in a paradise for nature lovers and adventure seekers alike. Home to howler monkeys, macaws, margays and morphos, get ready to share a trail with kinkajous and tamanduas! Climb to the top of Rainbow’s Roost, our observation deck, for sweeping views of the majestic Macal River valley. You can see for miles and miles! Then, head out for a guided pontoon boat tour on 5-mile Vaca Lake, home to hidden inlets and 3 spectacular waterfalls. Hike epic trails! Head out for a spelunking junket! Take your taste buds for a picnic to the palapa-covered picnic shelter. From jaw-dropping vistas and hiking trails through to wildlife corridors, Better in Belize Ecovillage offers acres of adventure and fun for everyone. Staying at Better in Belize is just the beginning of your adventure. We are nestled in the Cayo District, the most interesting and diversified area in Belize and a region full of culture, history and adventure. If you dig history, we’re 45 minutes from Xunantunich, one of Belize’s ancient Mayan sites. The quaint village of Benque Viejo del Carmen is 10 ½ miles down the road from us. Home to the Benque House of Culture, literary readings, world famous musicians, Benque Viejo Town Market, annual festivals and pageants, Free Trade Zone, and hot tamales, there’s no telling what delights you’ll uncover in this funky village in Western Belize! Email Candee or call us at 1-877-836-2756 (toll-free from North America) if you’d like to find out more! The information contained herein has been obtained from sources deemed reliable. While we have no reason to doubt its accuracy, we do not guarantee it and it is subject to change without notice.